Drive Systems Technology announces special pricing on IN-STOCK Delta brand variable frequency drives. We’ve made a special purchase of 2 sizes of Delta VFDs and are pleased to offer great pricing and immediate availability on these basic sensor-less vector inverters(VFDs). 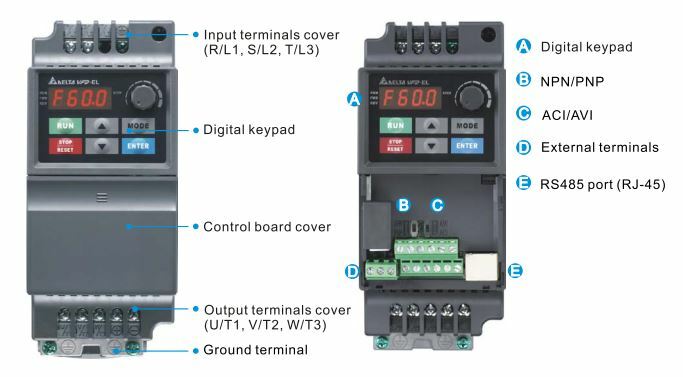 Equipped with on-board operator interface, this drive is ideal for quick installation with local control. Alternatively, the drive may be controlled remotely by wiring to the on-board terminal block.